Haiweeite: Mineral information, data and localities. Named by T.C. 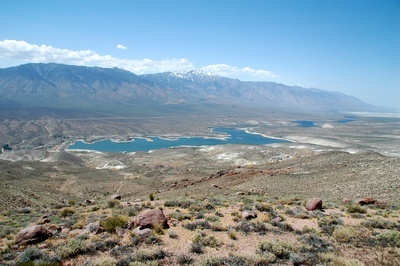 McBurney and Joseph Murdoch in 1959 for the Haiwee Reservoir, California, located near the type locality. 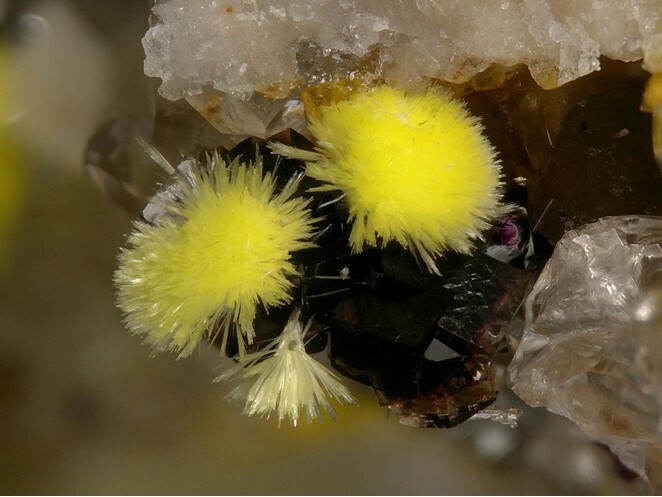 This page provides mineralogical data about Haiweeite. Y = pale yellow; Z = colorless. Y = b.
Spherulitic aggregates, or single flakelike grains, on fracture surfaces in granite. Gypsum 14 photos of Haiweeite associated with Gypsum on mindat.org. Phosphuranylite 8 photos of Haiweeite associated with Phosphuranylite on mindat.org. Fluorite 8 photos of Haiweeite associated with Fluorite on mindat.org. Uranophane 6 photos of Haiweeite associated with Uranophane on mindat.org. Uranophane-β 5 photos of Haiweeite associated with Uranophane-β on mindat.org. Selenite 3 photos of Haiweeite associated with Selenite on mindat.org. Calcite 3 photos of Haiweeite associated with Calcite on mindat.org. Sklodowskite 2 photos of Haiweeite associated with Sklodowskite on mindat.org. Phurcalite 1 photo of Haiweeite associated with Phurcalite on mindat.org. Quartz 1 photo of Haiweeite associated with Quartz on mindat.org. Contains uranium. Wash hands after handling. Do not lick or ingest. Store in uninhabited areas. de Carmargo, W.G.R. and Svisero, D.P. (1969) Haiweeite, a new occurrence in Brazil. Amercian Mineralogist: 54: 966-968. Yeremenko, G.K., Il'menov, Ye.S., and Azimi, N.A. (1977) Find of weeksite-group minerals in Afghanistan. Doklady Akademii Nauk SSSR Earth Science Sections: 237: 226-228. Yeremenko, G.K., Il'menov, Ye.S., and Azimi, N.A. (1977) Find of weeksite-group minerals in Afghanistan [Russian]. Doklady Akademii Nauk SSSR: 237: 1191-1193. Jambor, J.L. and Roberts, A.C. (1999) New mineral names. American Mineralogist: 84: 193-198. Burns, P.C. 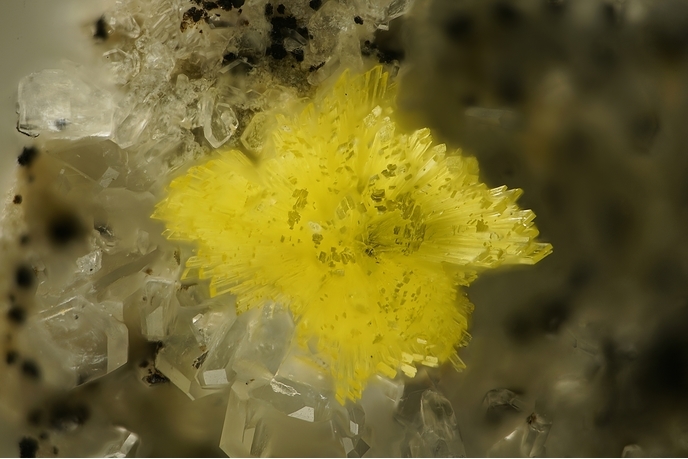 (2001) A new uranyl silicate sheet in the structure of haiweeite and comparison to other uranyl silicates. Canadian Mineralogist: 39: 1153-1160. 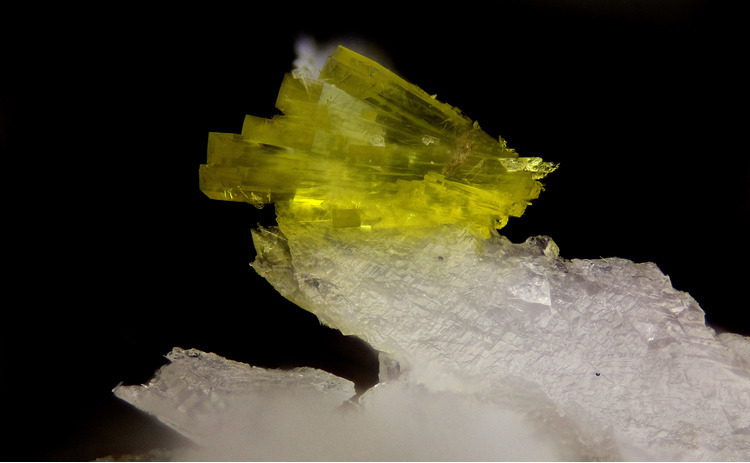 Frost, R.L., Cejka, J., Weier, M.L., and Martens, W. (2006) A Raman and infrared spectroscopic study of the uranyl silicates - weeksite, soddyite and haiweeite: Part 2. Spectrochimica Acta Part A-Molecular and Biomolecular Spectroscopy: 63: 305-312. Frost, R.L., Cejka, J., Weier, M.L., Martens, W., and Kloprogge, J.T. (2006) A Raman and infrared spectroscopic study of the uranyl silicates - weeksite, soddyite and haiweeite. Spectrochimica Acta Part A-Molecular and Biomolecular Spectroscopy: 64: 308-315. Plášil, J., Fejfarová, K., Čejka, J., Dušek, M., Škoda, R., and Sejkora, J. (2013) Revision of the crystal structure and chemical formula of haiweeite, Ca(UO2)2(Si5O12)(OH)2⋅6H2O. American Mineralogist: 98: 718-723. The following Haiweeite specimens are currently listed for sale on minfind.com. American Mineralogist: 84: 197-198.; Jambor, J.L. and Roberts, A.C. (2002) New mineral names. American Mineralogist: 87: 765-768. ALEXANDRE, P., UVAROVA, Y. & KYSER, T.K. (2012) Origin of uranous and uranil minerals at the Centennial deposit, Athabasca Basin, Northern Saskatchewan, Canada. Canadian Mineralogist, 50, 693-704.
ⓘ Zadní Chodov (Hinterkotten) ? JAHN, St.; SCHNAITMANN, E.A. ; NIEDERMAYR, G. (2010): Spektakuläre Neufunde aus dem Erongo (IV). - MINERALIEN-Welt (5), 60-66.
ⓘ La Cabrera pluton ? McBurney, Thomas Chester & Joseph Murdoch (1959), Haiweeite a new uranium mineral from California: American Mineralogist: 44: 839-843; Outerbridge, W.F., et al (1960), Weeksite, a new uranium silicate from the Thomas Range, Juab County, Utah, American Mineralogist: 45: 39-52; Pemberton, H. Earl (1983), Minerals of California; Van Nostrand Reinholt Press: 517.